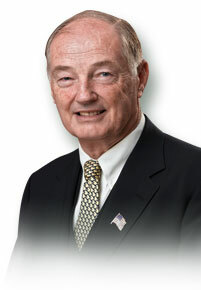 Dr. Frank W. Blake is currently working as a part-time consultant. He recently retired as vice president of engineering for EWA Government Systems Inc., after being responsible for the firm’s West Virginia operations for more than 20 years. In this capacity, he devised corporate-wide standards observed by all professional personnel, conducted a continuing quality control operation and established qualifications for new members of the professional staff. Prior to 1978 when he joined EWA, he was a radar analyst for the Army Foreign Science and Technical Center responsible for Soviet radar. He served three years in the U.S. Army as a radar operator on a Nike-Hercules missile base. A graduate of the University of Virginia (UVA) with bachelor’s, master’s and doctorate degrees in electrical engineering, he has also taken short courses at the Massachusetts Institute of Technology and at Harvard. With service on the Industrial Advisory Boards at UVA and at Norwich University, he has also served on the President’s Visiting Review Committee at UVA, where he evaluated and advised the electrical engineering department. Dr. Blake has taught undergraduate classes at the UVA School of Engineering and School of General Studies. In addition, he has served as coach and manager for youth baseball and ice hockey. Chairman of the Decadal Review Committee formed by Congressman Alan Mollohan, he was also a member of the IV&V Facility Strategic Assessment Committee, and served on the High Technology Foundation’s Procurement Advisory Board and its Affiliate Leadership Council. Awards he has received include the High Technology Foundation’s Small Business Mentor of the Year, Teaming to Win Teaming Advocate of the Year, and the Congressional Leadership Award for Mentoring Efforts (1990-2000). Dr. Blake is married to the former Elizabeth Price Green of Marlinton. They are the parents of a daughter and two sons.